Being the enthusiastic and hardy divers that we are, we don’t just plan underwater adventures in the Summer months, but into the Winter as well … and in fact last season most of the best dives were in the winter months. Eastbourne – 5th / 6th October. almost complete and rises to about 28m, she is more broken towards the stern. One of her best features is the huge anchor still hanging off her starboard side, it makes for a great photo with your buddy standing on it. Click here for more information. Lyme Bay is located on the Jurassic coastline which stretches from Exmouth in the West to Old Harry Rocks in the East. Geographically, it offers easy access to some of the excellent wreck diving you’d usually reach from harbours like Weymouth or Portland and more! This is a weekend trip on Saturday 9 & Sunday 10 November 2013 with two dives both days from the Ruby J, a hard boat. Ruby J has large kitting up benches, a stern mounted diver lift and on facilities, plus complimentary hot drinks and hot dogs between dives! 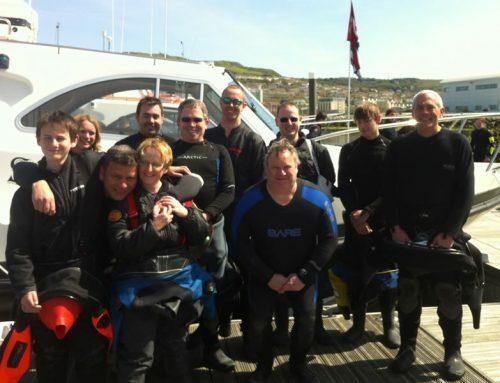 West Bay Diving is ideally positioned in the middle of Lyme Bay with access to over 60 wreck sites and many superb reefs with an abundance of incredibly diverse marine life and great scallop beds! Click here for more information. The Farne Islands offer superb diving in some of the clearest waters in the UK. Situated just 10 minutes boat ride from picturesque Seahouses Harbour, the Farnes are steeped in nature, history and superstition. Thank you Ken Powell for yet again organising some fabulous trips!